Ciara has always been kept at an arm's length by her community and family, but that doesn't stop them from using her as a weapon when it suits them. She's been raised to believe that her powerful gift of mind control is something evil that sets her apart, but Ciara has only ever wanted to belong and make her family proud. She lives in an Irish kingdom that practices Christianity and she serves as a constant reminder of the pagan past. Leif is the oldest son of a powerful jarl in Viking territory that I imagined to be present day Norway. At eighteen, he has a longship of his own and leads raids in his father's place. Revenge lurks within his heart for the death of his younger sister and a strange omen brings him to the shore of Ciara's kingdom in Ireland. For ages, the Celts have been at war with the Northmen. Both sides have done unspeakable things to the other and suffered devastating losses, but this battle is different. Ciara and Leif are forced together and find that despite all the things stacked against them that they must become allies. The pair is the only thing strong enough to lead an army against the giants that have risen to power and threaten both of their homelands. If they cannot learn to fight together, then the fate of the world will unravel and they will lose more than they ever could have imagined. Beyond a Darkened Shore is a thrill ride from start to finish that blends together Celtic and Norse lore. I loved learning more about these powerful ancient cultures as I followed along with Ciara and Leif on their quest to save Midgard. Both of these characters have a permanent place in my heart. Ciara is certainly one of my favorite YA heroines as she has strength, intellect, a sense of humor, a strong sense of loyalty, and the ability to love deeply. While she has all of those factors going for her in addition to beauty and fighting skills, she also has crippling self doubt from time to time which made her more relatable to someone who is perfectly ordinary. Leif also exhibits many of the same characteristics as Ciara in addition to superhuman strength and fighting prowess. He is the ultimate Norse warrior and the fact that he could give Thor a run for his money in the looks department doesn't hurt either. Seriously, Leif is swoon worthy for so many reasons. As I was reading I couldn't help but be reminded of the Greek myths that I read in school. Heroes were sent on various quests with life and death stakes attached to them. Along the way, these heroes had to battle creatures of lore and find a way to defeat them in order to continue on their journey. Furthermore, these heroes often had to battle with their selves and their companions. All of these elements that made Greek mythology so tantalizing for me as a young reader came to life as I was reading Beyond a Darkened Shore. The read was made all the more enjoyable because it breathed new life into mythology I was familiar with and had me googling to learn more about some of the unfamiliar parts. I also was intrigued by the connections between Celtic and Norse lore. 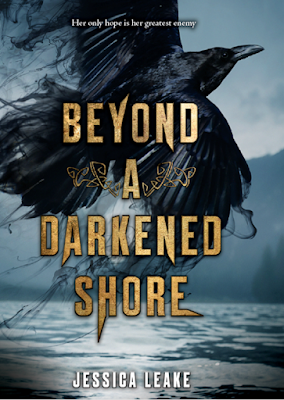 All in all, I would say that Beyond a Darkened Shore has certainly earned a place on my 2018 favorites list. It had everything I crave in a read: strong female main character, swoony leading man, historical setting, elements of the supernatural, and a plot that keeps me compelled to read just one more page regardless of the lateness of the hour. There are also some twists and turns that caused my mouth to drop open. I highly recommend picking this one up if you're a fan of mythology, Celtic or Norse history, and adventure. One Last Gripe: The battle scenes were a bit graphic for my taste, but they were realistic. First Sentence: I learned to hate the sea. Favorite Character: I can't choose! It's a tie between Ciara and Leif. Ooh nice! This one is in my TBR pile and I cannot wait to read it! Glad to hear it's rich with mythology! I love a good mythological like read! Lol! Great review!